When it comes to being safe, preparedness is one of the biggest defining factors in any emergency. Whether an injury is small or large, it does not matter as long as you are prepared for the situation at hand. Here at 1stAidSupplies.com, all of our kits are stocked with supplies ready to serve your emergency needs at a moment’s notice such as strip bandages, gauze rolls, tweezers, eye wash, burn relief gel and many others. The first aid kits come in a variety of different appearances including plastic, metal and soft casing. We provide first aid kits in all different sizes and purposes including vehicle (small, medium, large), metal (10, 16, 24, 36) and trauma (regular and deluxe). Each kit comes with a first aid checklist to make sure that you have all your products should it come time that an emergency situation happen. Click here to view our selection of individual first aid kits, or browse the products below to find the right first aid kit for you. Contains bandages, gloves, ice pack, antiseptic, & more in a metal case. Meets or exceeds ANSI standards to treat minor injuries for up to 5 people. This large vehicle first aid kit contains all the supplies you will need to treat minor injuries while on the road. Contains bandages, gloves, ice pack, antiseptic, & more in a metal case. Meets or exceeds ANSI standards to treat minor injuries for up to 3 people. 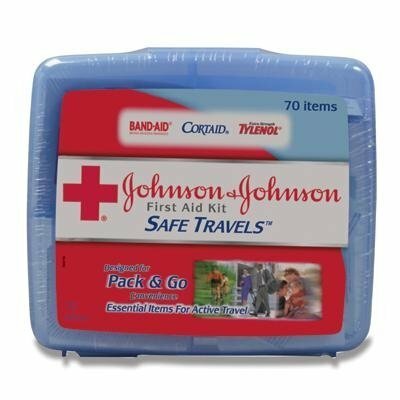 Small, convenient Johnson & Johnson travel first aid kit with Band-Aids, Tylenol, and more provides peace of mind while on the road. 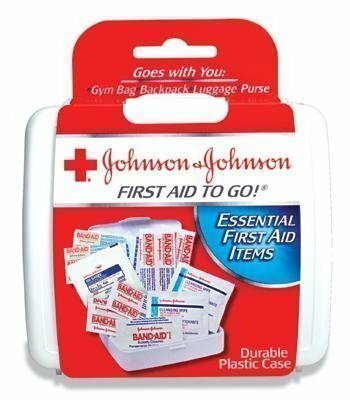 This Johnson & Johnson mini first aid kit provides safety & security on the go, at home, or in the workplace. Everything you need to treat minor injuries. Small metal vehicle kit fits most glove compartments and backpacks. Ideal for the treatment of minor injuries on the road.